Depixus (originally Picoseq) was founded in 2012 in Paris, based on IP developed by Vincent Croquette, David Bensimon, and Jean-François Allemand at École Normale Supérieure (ENS). In 2013 the company was seeking 5M Euros, but it’s not clear to me if the round closed . In May 2016 Arix Biosciences agreed to acquire up to ~20% of the company for 1.24M Euro (paid 0.93M Euro, with it appears the rest relying on milestone payments, though reports vary) . While the company is based in Paris, a Cambridge (UK) branch exists. Full accounts appear to be filed in the UK  and it seems that at the end of 2016 they had around 1M Euro is cash, and 800K Euro in cash to come. In 2016 operating costs were listed at 1.3M Euro, personnel costs at ~600K Euro. 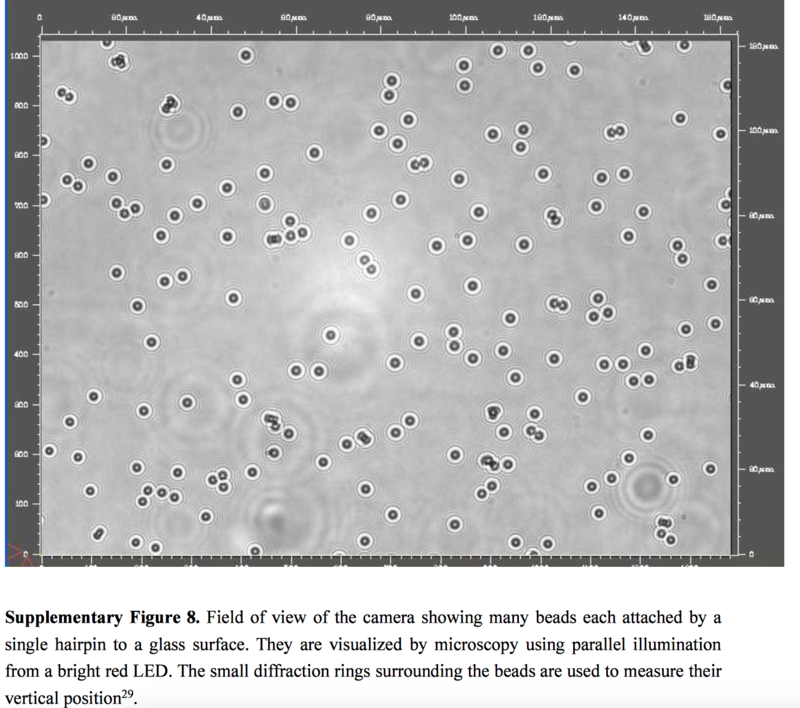 The technology behind Depixus is described in a 2012 paper. Fundamentally the detection process relies on the preparation of hairpin’d double stranded DNA (double stranded DNA with a loop on the end). One end of this strand is connected to a surface, the other to a magnetic bead. This system allows Depixus to measure the forces required to zip/unzip the DNA, and it is this measurement, and interference with the zipping process, that Depixus uses to sequence DNA. 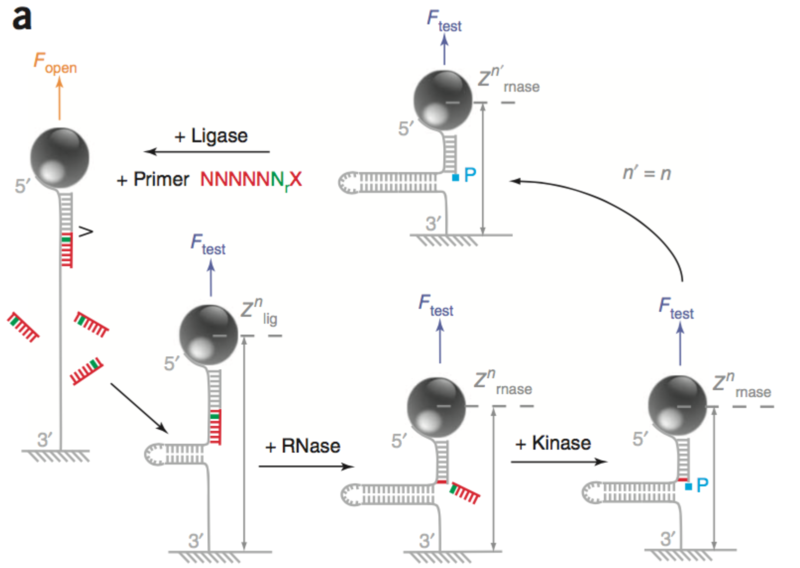 Ligation based sequencing from 2012 paper. In the 2012 paper  they show a hybridisation and a ligation scheme (illustrated in the schematic above). In this scheme they fully unzip the strand then ligate a probe (7mers, all Ns expect for a single known location). They then allow the strand to zip up again. If ligation was successful, the bead position is offset by ~5nm. This change in position, tells you if the probe ligated, and therefore which base is present at the known location. They then cleave off 6 nucleotides (if ligation was succesful) and perform the process cyclicly to determine the complete sequence of the strand. I briefly looked for additional progress on the platform since the 2012 paper. The website currently suggests that they are able to detection base modifications, but I was unable to determine the exact mechanism. One report on their Arix deal, suggests they have generated 286bp reads , but again provides few details. A patent from 2016  covers an improved detection system. Rather than imaging the beads directly they sit the beads in a well. The solution is conductive (contains ions I guess), and there is a bias voltage from the bottom of the well, into the solution. As the bead moves up and down it blocks the aperture of the well. This blocks the ionic current flow, effectively varying the resistance. So, you can measure that current blockage at determine how much the bead is blocking the aperture, and therefore its location. I’ve not yet been able to find other patents covering the detection of modified bases, it’s possible that they’re not yet available or that they can be found with further investigation. The technology is quite interesting, in some ways it reminds me of Cearus (detection via changes in beads location/movement) and Complete (ligation). As always it will be interesting to see how things progress. “Even so, Hamilton emphasized that he does not see PicoSeq as a direct competitor to existing or anticipated next-generation sequencing instruments. Rather, he argued that the mechanical hairpin method might have a range of applications that are distinct from — or complementary to — those offered by such platforms. For instance, because each DNA hairpin can be opened and closed tens of thousands of times, it should be possible to look at the same molecule multiple times — perhaps searching for a DNA fingerprint or barcode in one instance and profiling a full sequence or a suite of specific epigenetic modifications in another. Various references to Arix Biosciences investment. Accounts as of end of 2016, appear to have had 1M Euro in cash in hand, and 800K Euro to come.